The land of pharaohs, pyramids, sphinxes, and papyrus, Egypt needs little by way of introduction. Visitors find more than a textbook readout of ancient history when visiting the country--the power, scale, art, and mysticism of its centuries-old culture bleed out from each landmark attraction and seep into the everyday life. Bustling markets, the slow-flowing Nile, the vast desert, and inspiring archeological sites often sit right alongside palaces of great excess and historical importance. All ensure you have plenty to see and do during your vacation in Egypt. In the wake of the Arab Spring in 2011, travel to certain areas where conflict and terrorism are deemed likely remains inadvisable for foreign visitors. Egypt is in Africa. 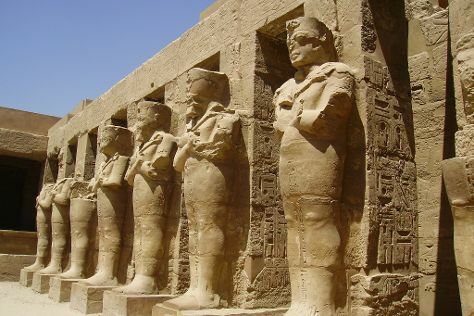 Use our Egypt trip planner to arrange your visit to Egypt and any other destinations in Egypt that take your fancy.